It's an undeniable fact: there are thousands and thousands of egg cups in the world (there are actually more than five thousand egg cups in this house, and we know this is only a very small portion of all the egg cups ever produced). Where do egg cup creators get their inspiration from? How can it be that there are so many different models and that new ones keep appearing? Well, some creators seem to like to look for inspiration in previously existing egg cups, and the truth is that models are not always THAT different. 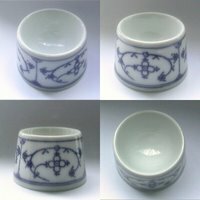 This is what we will explore in a series of posts titled "Very similar egg cups", a series that we start today with a plastic recreation of a china egg cup. 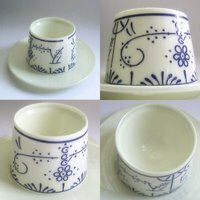 Known and maybe important details: 1) it's a non-footed china egg cup made by the German company Bareuther during the 1960 [eggcup1446]; 2) a very similar egg cup, made in plastic, with the same form as the previous one but including an integral saucer, produced by Belgian firm D.B.P. Plastics, probably at the end of 1970s/1980s [eggcup3362].